Home > C++	> Why POCO is well implemented and designed? Why POCO is well implemented and designed? This kind of statement “The modular and efficient design and implementation” is often used to describe libraries even if they are bad designed. I decided to verify if POCO is well designed and implemented as expected, for that I analyse it with CppDepend. The first remark is that POCO is well commented. Methods with many number of line of code are not easy to maintain and understand, let’s search for methods with more than 60 lines. 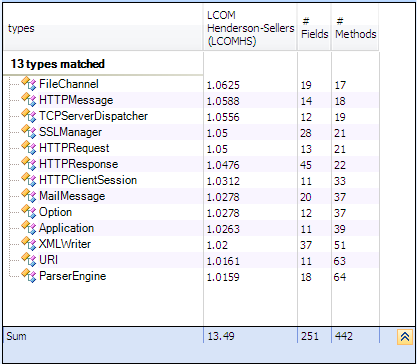 Less than 1% of methods has more than 60 lines. So only 1% of methods can be considered as complex. 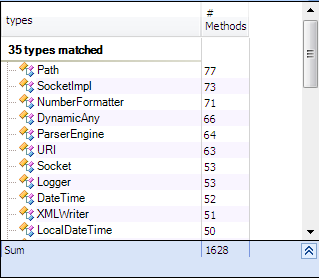 only 8 methods has too many variables. Only 3% of types has many methods. 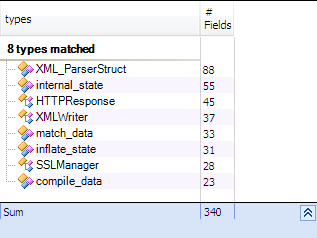 Less than 1% of types has many fields. We can say that POCO is well implemented,few methods are considered complex,the types are simple with few methods and fields and it’s well commented. 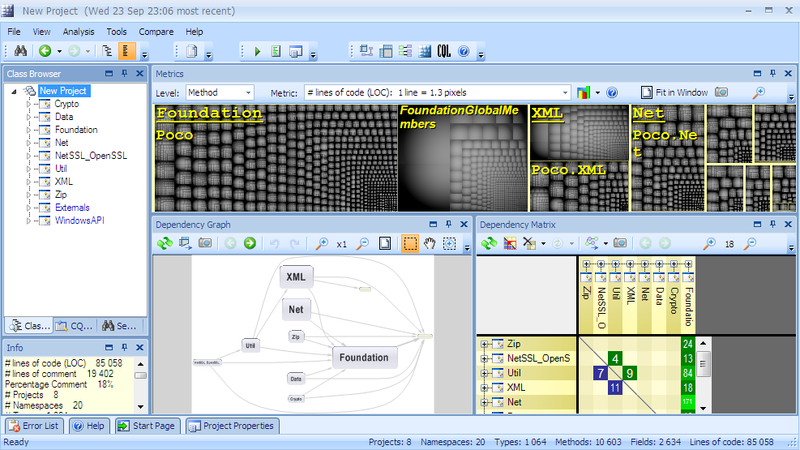 The “Abstractness vs Instability” graph can be useful to detect projects that will be difficult to maintain or evolve. This following post describe the utility of this graph and how to exploit it to improve the design. 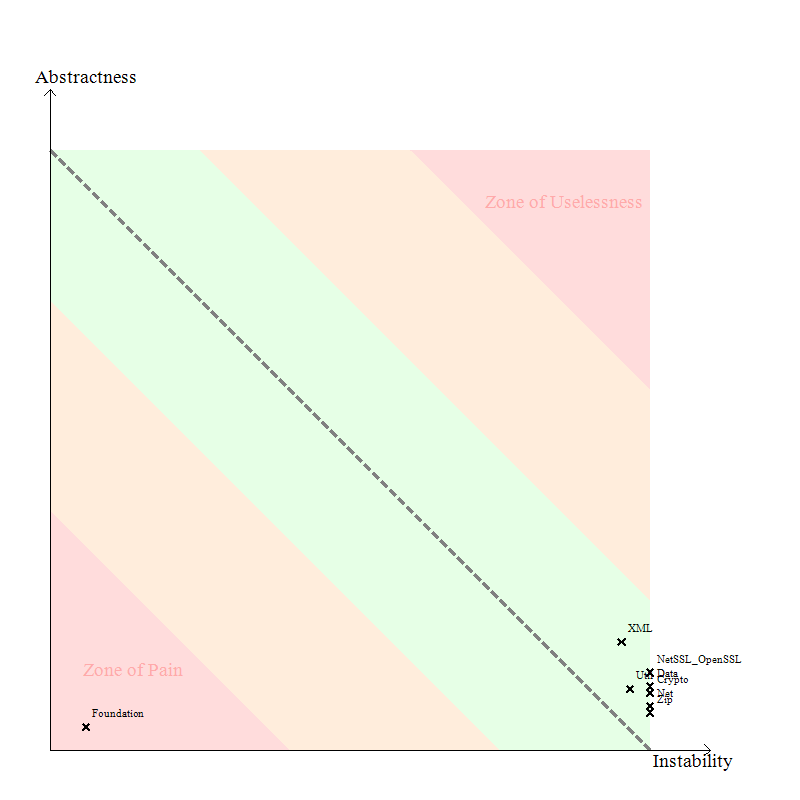 Only Fondation is inside the zone of pain , it’s normal because it’s very used by other projects. Multiple inheritane increase complexity ,and we have to use it carefully. The single responsibility principle states that a class should have more than one reason to change. Such a class is said to be cohesive. A high LCOM value generally pinpoints a poorly cohesive class. There are several LCOM metrics. The LCOM takes its values in the range [0-1]. The LCOMHS (HS stands for Henderson-Sellers) takes its values in the range [0-2]. 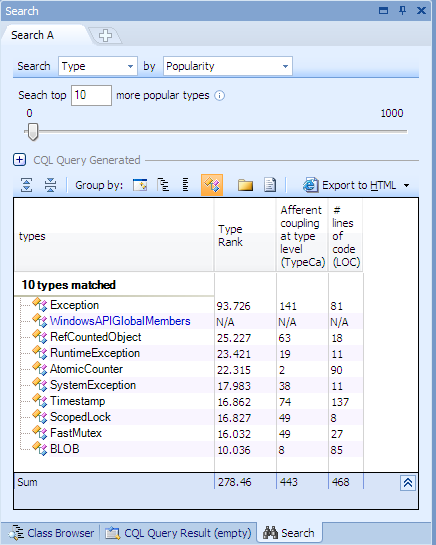 Note that the LCOMHS metric is often considered as more efficient to detect non-cohesive types. only 1% of types are considered as no cohesive. The Efferent Coupling for a particular type is the number of types it directly depends on. And the result is empty so no class has many responsabilities. It’s very interesting to know which types are most used,for that we can use the TypeRank metric. 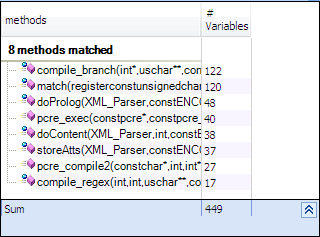 TypeRank values are computed by applying the Google PageRank algorithm on the graph of types’ dependencies. A homothety of center 0.15 is applied to make it so that the average of TypeRank is 1. Let’s search for types most used and complex. The result is empty so no popular class is complex. This post explain the level metric and how to exploit it to improve design. only 1 dependency cycle exist in this project. Poco is also well designed it’s high cohesive and low coupled. So what about Boost C++ libraries? 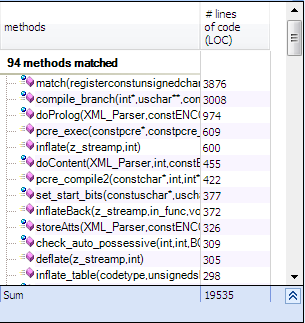 You can do it for Boost, the difference is that for POCO there’s vcproj that contains all info needed for the analysis, like additional include directory, preprocessing but for Boost we have to configure them, for that you can use ProjectMaker to add source file to analyse and add boost path to additional include path. I will wrote a post about Boost analysis, and you can do it with the version available at http://www.cppdepend.com. any feedback is welcome if you find some problems to analyse Boost. On the large, everything is peaches with Poco’s design. I love it and prefer PoCo (greatly) over anything boost-y or ACE-y. It is just so much simpler to use. On the detail level there are the usual annoyances. 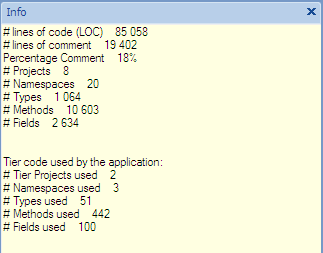 Example: I have tried to find time to make things compile on AIX 5.3 using the IBM XlC++ compiler. No dice, I even had to strip quite a few things (delegates/function/asynch stuff: mainly the dreaded template stuff) from Foundation to even get it to compile . I could not get Poco::Net to compile without the full (or at least more) of Foundation, and I couldn’t get enough of Foundation to compile, for spurious dependency on Poco::Net. Now why would such coupling not appear as problems in CppDepend? I haven’t tried CppDepend but I figure it migh have much to do with the tool possibly missing some of the preprocessing logic (the _WIN32, _UNIX or _POSIX includes e.g.) to spot the coupling. I launched analysis for vcproj files so for windows OS, maybe it was dependency cycle beteween Net and Fondation for other OS. and about preprocessing logic if you want to analyse it for unix you can use ProjectMaker(http://www.cppdepend.com/ProjectMaker.aspx) to specify your preprocessing. Foundation does not depend on the Net library. If it would, this would be a huge design failure. It does, however, require the socket API in the Environment::nodeId() member function (or, rather its actual implementation in nodeIdImpl()). The size of the Foundation library is one of the things we’d like to change in POCO 2.0. As for the IBM compiler: it’s now been more than 10 years that the C++ Standard if out, so I guess its reasonable to expect that at least the compilers from major manufacturers fully support it. It puzzles me a bit though, because I’ve heard of people compiling it successfully with xlC++ 8, with a few patches (which have been included in 1.3.4; may not be in the trunk yet). I don’t have access to an AIX machine, so I cannot verify this. I reviewed my patch and I must agree: I had overlooked that the ‘GetAdaptersInfo’ stuff in WIN32 was in fact _not_ Poco::Net code, but Win32 API (Windows 5.0+). I must have done a grep when in a hurry, because the same function appeared in Poco::Net (of course, being called) and I might have quickly drawn the conclusion it was _defined_ there, without actually reading it. I apologize for drawing that premature conclusion and posting it here. 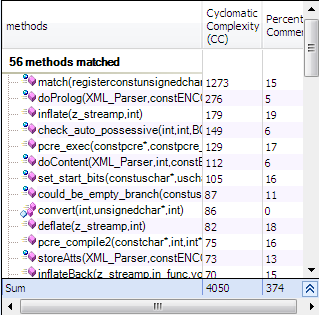 Moreover: this explain why the dependency did not show up in CppDepend. Needless to say, I’m so going to give this tool a test drive once I get the time! 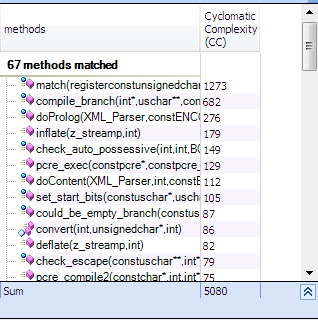 you can find the GetAdaptersInfo dependency in WindowsAPI in CppDepend, and you can right click in the method and search for methods that use it and you will find NodeIdImpl of EnvironementImpl. Where’s the model for MFC Doc/View Design? Refactoring:What’s the origin of bad design?